Watch the puppies on the puppy cam from noon to 5PM. WELCOME to Calypso Breeze Australian Labradoodles! Our passion for the wonderful Australian Labradoodle began in 2009 when searching for a dog to help my husband, Jerry, recover from a stroke. 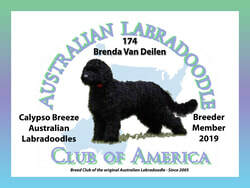 We invested countless hours researching the different Labradoodle breeds and decided that the Australian Labradoodle was the only choice for us. We added Moose to our family that same year and just a year later decided that we wanted to share the amazing Australian Labradoodle with the world. Our dogs and puppies live in our home with us and are a beloved part of our family. The puppies are born in our bedrooms and stay there until they're 4 weeks old and then move to the main living area of our home where they begin to discover the sights and sounds of a typical household. We expose our pups to many different stimuli to help build confidence and curiosity so they're well adjusted when they leave for their forever homes. Each puppy receives an abundant amount of love and care while with us. 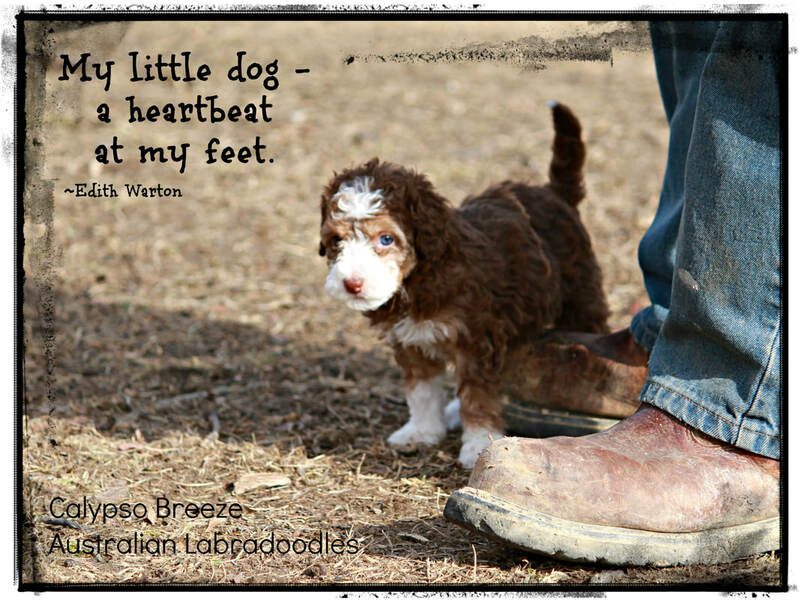 Over the years, several of our Australian Labradoodle puppies have gone on to be service dogs, therapy dogs, and of course faithful companions for many terrific families! We lost Jerry in 2015, but we continue our shared dream, providing Australian Labradoodle puppies to families across the United States and abroad. We hope you'll enjoy your time browsing through our site and please be sure to contact us via email or phone with any questions you may have! Our Australian Labradoodles can be found in Tennessee, Georgia, Florida, Alabama, Louisiana, Mississippi,Texas, South Carolina, North Carolina, West Virginia, Maryland, Pennsylvania, New Jersey, New York, Connecticut, Rhode Island, Massachusetts, Maine, Michigan, Indiana, Illinois, Oklahoma, Colorado, California, and Oregon. ​Also in The Netherlands, Poland, and Mexico!